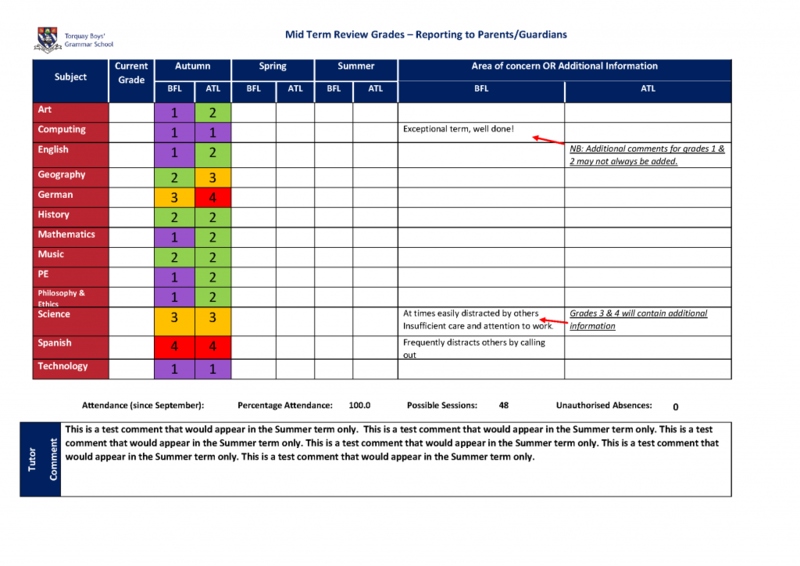 This grade indicates the extent to which the student’s behaviour positively supports their own learning and that of other students. Exc Exceptional Behaviour is consistently outstanding at all times. -	You are always polite and respectful towards all staff and all other students. -	You anticipate the expectations of staff and act accordingly. -	You are willing and able to take responsibility for your own behaviour and manage it effectively at all times and in all situations. -	You make a significant contribution towards the establishment of a positive ethos in the classroom. (2) Good Behaviour is good at all times. -	Your behaviour is welcoming and positive – you can behave considerately towards others in the lesson. -	You are polite and respectful towards all staff and most other students. -	You respond quickly and well to any additional guidance from staff about how to conduct yourself. -	You understand what is expected of you when asked to work on your own, or in small groups; only gentle prompting is needed to maintain discipline. -	You routinely show responsibility in responding to the expectations of staff. -	Your behaviour makes a positive contribution to learning in lessons. -	You occasionally behave so that learning is interrupted and time is wasted. -	At times you are not always polite and/or respectful to others. -	At times you struggle to work effectively on your own, or with others and need frequent prompting in order to remain focused. -	There are occasional incidents of inadequate behaviour, but where they occur you respond appropriately to the sanctions applied. -	Time is wasted through your persistent low-level disruption, excessive off-task chatter and a lack of attention in too many lessons. -	You are frequently off task and need constant prompting in order to remain focused. -	You show a lack of respect for – or direct challenge to – adults or other young people. -	Poor behaviour and rudeness occur more frequently than on very isolated occasions and this inhibits progress in lessons. This grade indicates the extent to which the student is actively demonstrating positive attitudes within the subject that support their own learning and progress. The extent to which the student engages in the learning process in order to make progress. -	You have a very positive attitude towards learning and self-improvement. -	You always persevere and embrace challenges. You are determined not only to succeed in these situations, but also to learn about yourself and how you learn. -	You consistently focus on the learning process as well as the outcome. -	You respond positively when mistakes are made, viewing this as feedback about the task, not as a judgement of who you are as a person. -	You possess strategies for dealing with frustration and you always stay focused during difficult tasks. -	You always demonstrate a strong desire to be challenged. -	You regularly demonstrate a high degree of emotional resilience. -	You understand that you can become more intelligent with effective effort combined with strategic support from the teacher. -	You are willing to give yourself time and space to learn work thoroughly. You make excellent progress because of this. -	You have a good attitude towards learning and self- improvement. -	With encouragement you will usually persevere and embrace challenges. At times you show a determination not only to succeed in these situations, but also to learn about yourself and how you learn. -	You frequently try to learn from your errors and use them to help you make progress in future learning/see effort as the route to mastery. -	You often focus on the learning process as well as the outcome. -	You regularly stay focused during difficult tasks and, at times, show that you can deal with your frustrations independently. -	You often show a desire to be challenged. -	At times you demonstrate emotional resilience. -	Occasionally, you are willing to give yourself time and space to learn work thoroughly. You make good progress when you work this way. -	You often give up too easily when you find the work challenging and signs of improvement are limited. You need to set micro targets to help you make better progress. -	At times, you have a good attitude towards learning and self- improvement, but this could be improved further. -	You are not always willing to learn from your errors and use them to help you make progress in future learning. -	You do not routinely demonstrate high effort levels, or understand that effort is the route to mastery. -	At present, you do not always focus on the learning process, with too much emphasis placed on the outcome. -	During difficult tasks you do not always stay focused and you are not yet able to deal with your frustrations independently. -	You could show a stronger desire to be challenged in each lesson. -	At times you do not give yourself time and space to learn work thoroughly, this can affect your progress in the lesson. -	You regularly give up on more challenging tasks and signs of improvement are severely limited. You need to ask for help and set micro targets to help you make progress. -	You have not yet developed a positive attitude towards learning and self-improvement. -	You regularly do not focus on the learning process, with too much emphasis placed on the outcome. -	You are not willing to learn from your errors and use them to help you make progress in future learning. -	You routinely demonstrate poor effort levels and do not understand that effort is the route to mastery. -	During difficult tasks you do not focus and will not attempt to deal with frustrations independently. -	You show no desire to be challenged in each lesson. -	You routinely do not give yourself time and space to learn work thoroughly. This is significantly affecting your progress in the lesson.